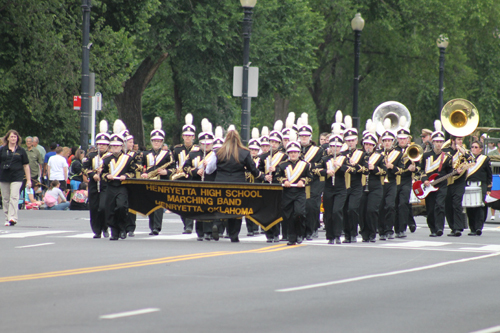 Henryetta high school band members and boosters will be working for the next 18 months to raise money for a second trip to the National Memorial Day parade in Washington, D.C. The HHS band marched down Pennsylvania Avenue May 27, 2013 before some 300,000 spectators. “We have been invited back again,” said band director Alan Montgomery. He said it will take about $1,000 per person to make the trip. “That amounts to about $71 per person each month for the next 14 months,” he told the board. As part of the 2013 trip, students were taken to various monuments and national parks including Arlington Cemetery, the Smithsonian Air and Space museum, Lincoln, Martin Luther King and Jefferson memorials, as well as the Capitol, Vietnam Wall and Korean War memorial. Montgomery said a series of fundraisers will be held throughout the coming months with that goal in mind. Once the money is raised, students will be taken to Washington by charter bus.